Make your registration and renewal quick and easy with MVD Express! As a vehicle owner, you do everything you can to ensure that your car is well-maintained. While caring for the mechanical components of your vehicle is important to help it function properly, it’s also important that you take the time to properly license and register your vehicle if you plan on driving it on the road. A tiny slip of paper may seem insignificant, but if you fail to register your car or renew that registration before it expires, you may find yourself facing the consequences. Luckily, if you live in New Mexico, MVD Express makes it easy to register and renew your vehicle when the time comes. Our mission is to provide you with fast, friendly services so that you can get in, get out, and get back on the road. Instead of visiting a traditional MVD where you may have to wait hours in a seemingly endless line, MVD Express gives you the option to schedule your appointment in advance, allowing you to walk right in and tackle the tasks at hand. 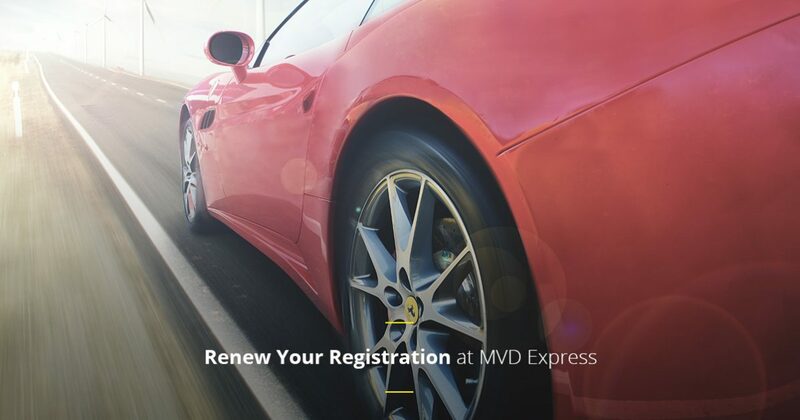 If it’s time for you to register your vehicle or renew your existing registration, don’t settle for anything less than MVD Express. Your vehicle registration is a slip of paper that states that your vehicle is registered in the state of New Mexico. That being said, it’s easy to forget that you need to renew your registration, but failing to renew can lead to a number of consequences. Being pulled over and cited by a police officer for having an expired tag. Being required to pay fines and fees to the state for not registering your vehicle on time. Being required to appear in court to demonstrate that you have registered your car. Being fined anywhere from $10 to as much as 75 percent of your registration costs to legally drive your vehicle again. Depending on the circumstances surrounding your expired registration, fines and penalties can vary. Always check your registration on the last day of the month to ensure that you won’t incur penalties for forgetting to renew! In New Mexico, renewing your vehicle registration is easy! If you are unable to visit your local MVD, you have the option of renewing in the comfort of your own home. In fact, there are three different ways that you can renew your vehicle in the state of New Mexico. Regardless of how you choose to renew your registration, you will need the license plate number of your vehicle and the VIN number. Certain methods may require additional information. Need to Renew Your Registration? If it’s time for you to renew the registration on your vehicle, MVD Express can help! We make it easy for you to receive fast, friendly service on all of your MVD needs, including your vehicle registration. Whether you’re renewing early, on-time, or it slipped your mind and you’re renewing late, we are here to help. Browse our website to learn more about all of the MVD services that we have to offer, and give us a call to schedule your appointment today! We can’t wait to see you.